Bring springy style to serving fruit, salads, or bread with Lisa Fida's floral bowl. We think Mother Nature would be proud of the process Lisa Fida uses to create this floral glass bowl. She's inspired by the yellow, red, and white perennial favorites but turns to her computer to create a multicolored silkscreen of the flower. It's printed onto a glass disk, which Lisa then fuses to another in her kiln to protect the vibrant image from fading or chipping. 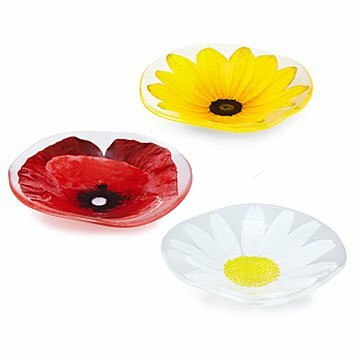 Finally, the glass circle is "slumped" (glassmaker speak for letting a mold and gravity give a new shape to a piece), creating a wavy edge that reminds us of blossoms waving in the wind. It adds springy style to serving fruit, salads, or bread. Handmade in Lowell, Maine. A gift for my mother's birthday. She said it was "beautiful!" It's useful and a perfect pop of color for a room. We have it sitting on our beautiful granite top desk. I love this bowl. In the depth of winter it provided a cheery note on my dining room table. This bowl was perfect for my sister, she loved it.